Unusual asymmetric EB - can someone explain? I need help identifying what is happening with this eclipsing binary star with asymmetric primary and secondary transits. 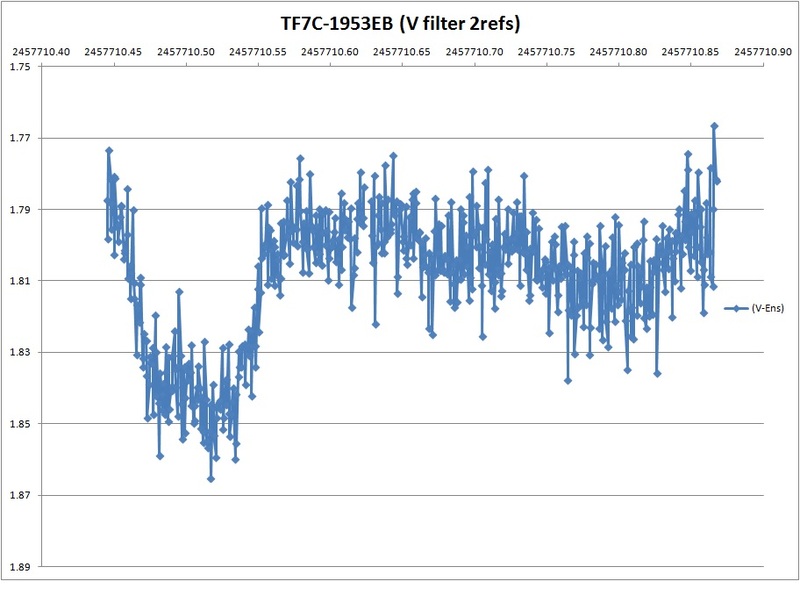 Please see 90 day phase plot and recent R and V filter LCs. The star is not in VSX or other known variable star database. Star Vmag=11.5 and is located in Cassiopeia. LC mags are differential. The period is 0.612 d.
I found this star with my survey telescope which is looking for exoplanets. This survey, called the Galactic Plane Exoplanet Survey (GPX), was presented at the AAVSO Fall 2016 conference. 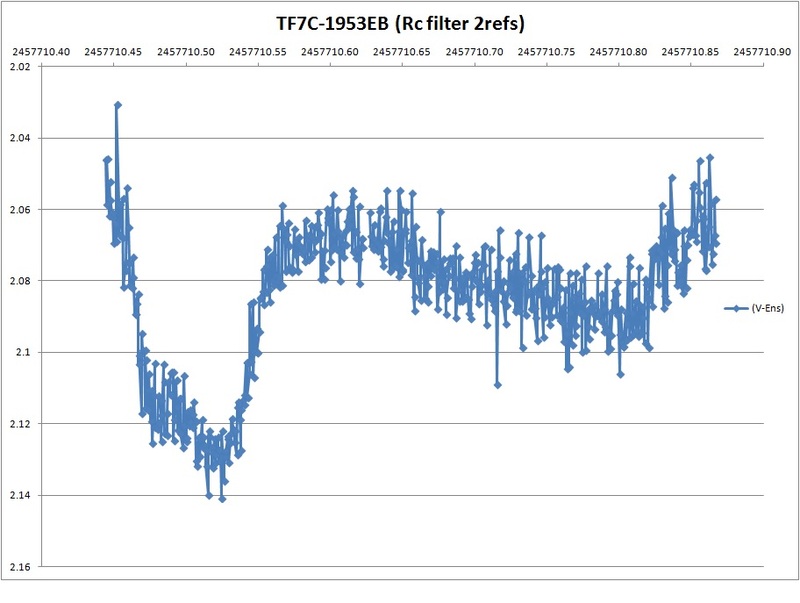 If someone had shown me this light curve without telling me the period and amplitude of the variation, I would have said without hesitation that it resembles an eclipsing cataclysmic variable. Specifically, it is reminiscent of the quiescent light curve of IP Peg: a wide primary eclipse of the accretion disk, a pre-eclipse hump corresponding with the appearance of the stream-disk hotspot, and a general fading towards the orbital phase opposite the eclipse. However, the amplitude of the variation seems much too low to be from a CV. Although the donor star contributes much more optical light in longer-period systems (thereby diluting the contribution from the disk), an eclipse depth of ~0.08 mag strikes me as unrealistically shallow for a CV, unless perhaps only the very edge of the disk is blocked (e.g., as in U Gem). But even with the relatively bright donor star, my intuition is that the dilution of the variability wouldn't be this extreme. Is this source blended with another in your images? The orbital period would be rather long for a CV, but not unprecedented. Perhaps a member of the VSX team (especially Sebastian) would have a better idea. Thanks for your thoughts on this star. I attached a IP PEG LC from BPO and see the similarities at least in shape of LC. I did not see a blended star from my 14" SCT images. I forgot to mention that this star appears to be surrounded by nebula. See attached Aladin closeup image. I don't see a nebula there. 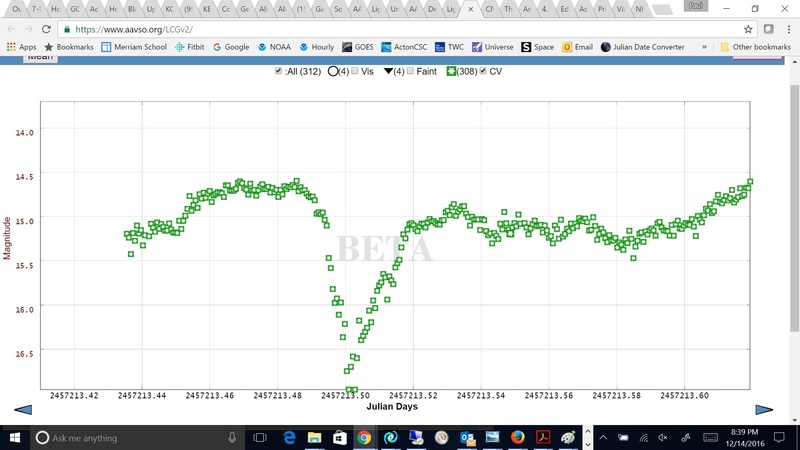 I think that looks like scattered light from the star -- not that that diminishes my interest in your light curve. 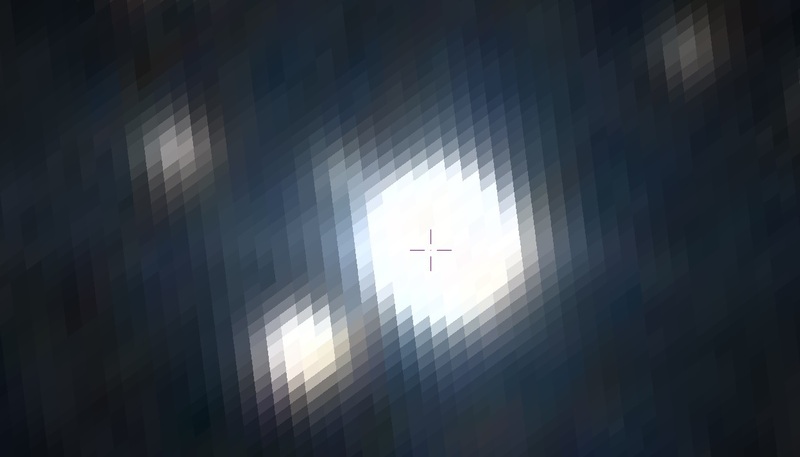 If that's an approximately true-color image, then the star looks quite blue. In the highly diluted CV scenario that I floated, we'd expect to see a bright, red donor dominate the optical light. That, coupled with all of the other issues that I mentioned earlier, pretty much rules out a CV, despite the morphological similarities with IP Peg and U Gem. I am by no means an expert on this subject! However, I have done extended research on the Central Stars of Variable Nebula. These tend to have nebulosity surrounding them. I have concluded some of the variability that I see comes from the nebula. Several have looked at the data and commented about this over the years. My guess is that the software sometimes interprets the star brighter than it is based on the nebula. 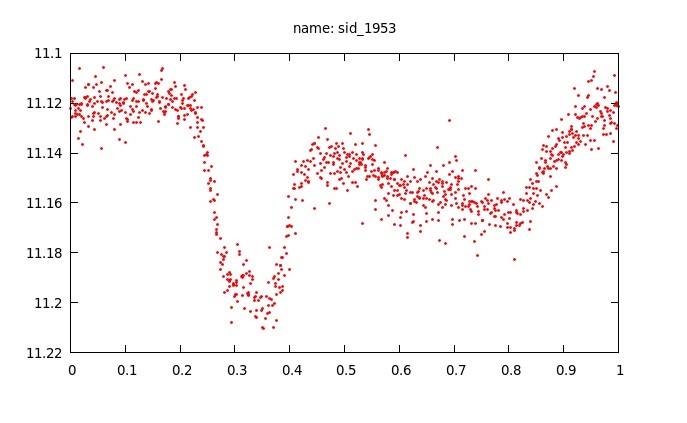 White dwarfs often show microvaribility in a sine curve sort of way. You often get half to whole magnitude jumps that obscure the micro curves and this is most often attributed to the nebula. Just something to consider. Whatever this is, it's a great discovery. Congratulations. I see papers in professional journals in the future. are you willing to provide coordinates for this object ? 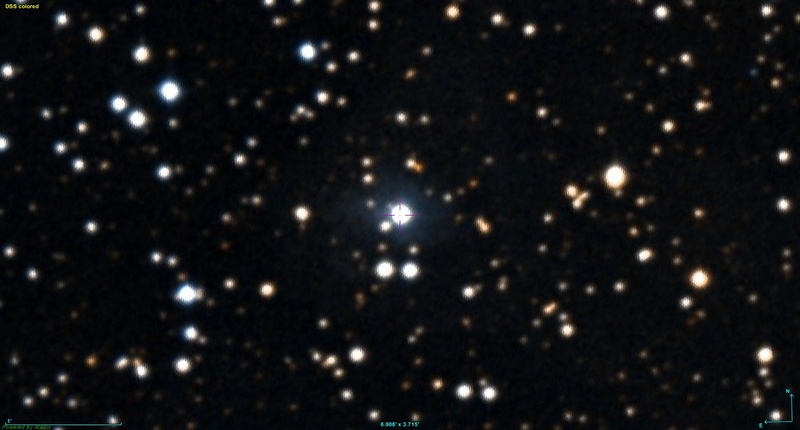 A professional astronomer who checked out this forum suggested that this star could be a T-Tauri spotted star with asymmetric coverage on opposite hemispheres which with rotation, could pass for W UMa-type eclipsers. As for future plans, I do not have the background to write a paper on variable stars. I am not sure if this star is very important or ordinary, so I am awaiting for more feedback. If important, I am looking for someone wishing to adopt this star with intent to publish and hopefully use AAVSO resources to collect data. With my GPX survey focusing on exoplanets, there will likely be other unusual varaibles found which I hope to find a home for research and possible publication. For anyone interested, this star is now in VSX and in the AAVSO database with reference stars available. I uploaded my data. Attached is an Aladin image showing nebulosity around the star. It would be nice to know if the nebulosity is associated with the star in some way, and over time, if the light curve changes. Although I previously questioned whether there is any nebulosity, the wide-field image makes it very clear that there is indeed a reflection nebula surrounding the star. Moreover, the WISE images of this field (see link below) plainly show that your star is situated within a "bubble" of nebulosity, particularly in the W3 band. I wonder whether this might be indicative of a strong wind.